It’s true that life in a studio apartment can be a challenge, but if you’re up for it, the rewards are endless. For many, a studio apartment presents the opportunity to declutter and frankly that’s something that many people could stand to do. After all, how many things do we own that we don’t really want or need anymore? Many of us have a way of simply keeping things around because we have the space. The great news is that at Summit Riverside Apartments in Littleton, we offer luxury apartments with loft spaces, ensuring that you can minimize your belongings without losing out on your comfort. There’s a lot to love about our little community and if you’re interested in one of our studio apartments, we have a few tips in today’s post about how you can make the most out of your living space. Keep reading to learn more! This is true of any living space, but it’s especially true in a studio apartment. You have less space to work with so it’s important to take a look at how you’ll be utilizing your space before you dive in and start decorating. For example, do you plan to have a lot of guests over? You’ll want to find ways to maximize seating. Planning to use your space primarily for yourself? You will probably be just fine with a cozy chair instead of a sofa. 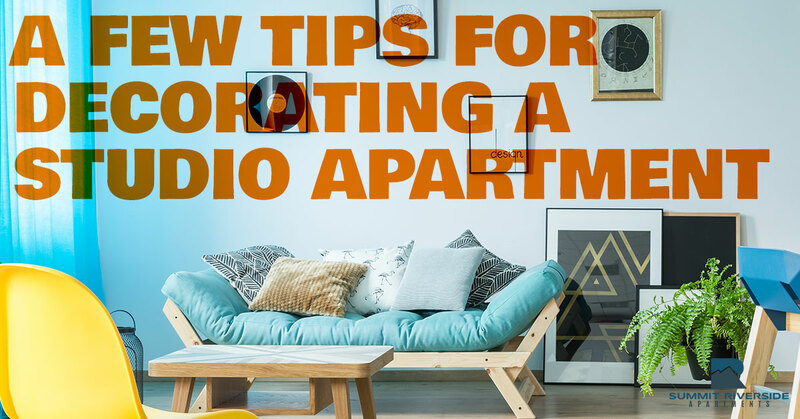 Whatever the case may be, settling on a layout represents a bit of a challenge, but the key is to take a good hard look at what you want the mood of your studio apartment to be. Once you have the answer, you can start making steps in the right direction. How Does Your Art Add to the Space? A big obstacle for a lot of people is deciding on how they will utilize art in their living spaces. Should you go with one large piece of art on the wall or would it be better to do a gallery wall made up of smaller pieces? Only you can know what’s best for you. Either way, considering how you will use art to fill your space is another part of the equation. Wise choices will ensure that you end up with a living space that you genuinely enjoy living in and when it comes right down to it, isn’t that the point? Our suggestion to cozy up a space is to choose art that makes you feel something. Don’t settle for something just because you think you need to fill the space. Take your time and make sure you get it right or else you’ll always be on the lookout for something different. In the meantime, fill your apartment with plants, polaroid photos, postcards, and anything else that looks great. It’s okay for your apartment to be a work in progress and these items are easy to rearrange to suit your needs at any time. Maybe you’re in need of some ideas to get yourself started off on the right foot. There’s nothing wrong with that! The internet is a great place to find similar living spaces and see what others have done. The important thing to keep in mind is that you’re just looking for ideas. Don’t get too focused on recreating a space. Instead, look at photos and figure out what it is you like about that particular apartment and strive to find a way that you can recreate that mood. Places like Apartment Therapy, Pinterest, and HGTV can provide you with great starting points, but it also pays to seek out magazines and books on the subject. Head on over to the Bemis Public Library and get a library card if you’re on a budget. You can also simply utilize Google’s image search to come up with ideas. At the end of the day, sometimes a little inspiration goes a long way so take a look and use what you find to create your own space. At Summit Riverside, our luxury apartments are specifically designed to give tenants an amazing base to work from. We believe that you deserve to live in a space that you love and that’s exactly what we hope to provide you with. We have a number of floor plans to choose from, so there’s something for everyone. And yes, we do offer a studio apartment with loft space, so if you’ve been looking for loft apartments for rent in Littleton and you’re in need of a studio, we have the perfect option! It gives you just enough extra space while also helping you to live minimally. It’s a win/win! With amenities that include nearby bike trails, a clubhouse, a fitness center, outdoor heated saltwater pool, basketball court, and more, there’s a lot to love! Units include stainless steel appliances, designer flooring, cozy carpeting, patios and balconies, walk-in closets, central heating and air, and beautiful cabinets. We even have a pet-loving community that enjoys celebrating your pet’s barkday paw-ty! It doesn’t get much better than that. But you don’t have to take our word for it. Come by and take a look with your own two eyes and see what makes Summit Riverside Apartments in Littleton so great. Schedule a tour today! We look forward to hearing from you.